We’d love your help. 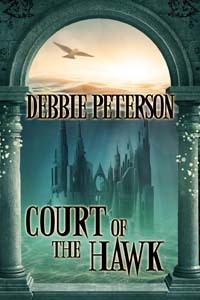 Let us know what’s wrong with this preview of Court of the Hawk by Debbie Peterson. To ask other readers questions about Court of the Hawk, please sign up. I cannot find this book anywhere and I am desperate to read it. Can anybody help me? Summer I'm pretty sure you can order it from the publisher (The Wild Rose Press) in any format you want. A lovely multi-layered tale that combines romance, myth and mystery in a gripping story that had me eagerly flipping pages in my Kindle. From the rich historical legends to the gorgeously-detailed settings and, especially, the enchanting characters who populate the worlds Ms. Peterson creates, this novel is beautifully beguiling. An ancient Welsh castle, a kingdom beneath the waves, the missing heart of a dragon, Fey Folk, and a noble ghost are just a few of the fantastical people and places tha A lovely multi-layered tale that combines romance, myth and mystery in a gripping story that had me eagerly flipping pages in my Kindle. From the rich historical legends to the gorgeously-detailed settings and, especially, the enchanting characters who populate the worlds Ms. Peterson creates, this novel is beautifully beguiling. An ancient Welsh castle, a kingdom beneath the waves, the missing heart of a dragon, Fey Folk, and a noble ghost are just a few of the fantastical people and places that populate the story. The main characters—Dr. S. E. DeSpencer (“Essie”) and Lord Garreth ap Daffyd are a couple you can’t help cheering for as they race against time to prevent a cyclic catastrophe that threatens Garreth’s world. Their romance is sweet and heartfelt. Essie is intelligent, determined and fearless, standing her ground when the need arises. Garreth is noble, protective, and decisive as a leader should be. I especially loved the ghost, Helyan, who has a supporting role in the story but deserves a complete novel of his own. Hopefully, that is coming. As a counterbalance to the detailed history and intricate plot the author weaves into her story, there is banter and fun, too. A thread that runs from beginning to the end involves Garreth trying to decipher what the initials S. E. in Essie’s name stand for. And yes, we do find out, but you’ll have to read this wonderful tale yourself for the answer. Don’t miss another great adventure/mystery/romance from an author who excels at them! Such a great story that reads like a fairytale. S.E. DeSpencer or Essie is hired by Lord Garreth ap Daffyd the King of a cursed people that is being slowly destroyed by a devastating act of nature every 400 years. Lord Garreth is determined to find the key to the curse and stop it before the next disaster hits in 6 months. He has hired Essie to try to translate ancient writing in a cave that may hold the secrets he's searching for. As the days go on and Essie gets closer to the figuring out the translation she also grows closer with Garreth and his people. The more she learns about the translation the more complicated breaking the curse seems to get, soon she finds herself talking to ghosts, having dinner with the King and queen of the Tylwyth Tegor (the fair folk ) and believing in dragons and other magical beings. The journey to discover how to stop the curse is fraught with peril and someone is desperately trying to stop them from discovering the secret first. Essie is falling in love and can't bare the idea of another disaster claiming lives of the people she has come to love but will they be able to brake the curse before time runs out ? Immerse yourself in this beautiful love story filled with magic, romance adventure and danger. No cliffhangers which is a nice bonus. I ADORE Debbie Peterson's books! This book captured me from the very first paragraph and kept me enthralled the entire book. I LOVE that there was a strong female character and enjoyed the mystery and bantering of the men trying to guess her real name...fun scenes! The setting is PERFECT as it is in a castle, deciphering old pictures, old texts, and old folklore, while at the same time being in modern-day times where she wore jeans, hiking boots, and t-shirts and used the internet and email. I kept I ADORE Debbie Peterson's books! The setting is PERFECT as it is in a castle, deciphering old pictures, old texts, and old folklore, while at the same time being in modern-day times where she wore jeans, hiking boots, and t-shirts and used the internet and email. I kept waiting for ballgowns and letter carriers as the descriptions took you back in time in such a VERY fun way. The magic of fair folk and dragons and wizards is enhanced by a wonderful adventure of trying to find the dragon's heart gem...so captivating! And the romantic interest between the two main characters gives you just enough details to make you sigh--so well written! Such an AMAZINGLY WONDERFUL read! Debbie is definitely one of my FAVORITE authors! I received this book from Goddess Fish Promotions in return for a fair and honest review. Excuse me for a moment but I am about to fangirl on you! There is so much to love in this book for me - ancient tales, mythology, Wales, soul mates, true love, flirty ghosts, spoiled princesses, dastardly deeds, you name it. What you get is a book that is as engrossing as it is interesting. You will turn each page and gasp at the wonder held within those words. This is storytelling as its best. This is a tale I received this book from Goddess Fish Promotions in return for a fair and honest review. This is a tale of two parts - on one side, you have disaster looming, with the loss of hundreds of lives and time is running out. On the other side, you have the long-running banter about what the initials S.E. actually stand for. And yes, you do find out and no, it won't be anything you imagined yourself! The writing is seamless, the plot line is full and well thought out, the timing is balanced, allowing you moments of rest and laughter amidst the impending doom. There were no editing or grammatical errors that I found but I will also admit to being so completely engrossed in the storyline, I didn't really check for any from about 10% in. I can only imagine the amount of research that has gone into this book as every detail is given into things I've never even thought of. This is the first book I have read by Debbie Peterson but it certainly won't be the last. The intricate weaving of her tale has made her a notable author in my book and I will certainly be on the lookout for more of her work to devour. I just loved this book. I loved the whole story line and the way Debbie writes you don't want to put it down. The mystery and the love story was fantastic...I would highly recommend it..One of my favorites.. Received this book last night, stayed up late and got up early to finish it! I just loved it! This was kind of a super cheese-ball romance/fantasy/save the world book. I was in the mood for just such a book, and this fit the bill. The reason I gave it just 3 stars is that the writing -specifically the dialogue - was stilted and didn't flow naturally. The phrasing of much of what was said was awkward. But if you can get past that and want an awesome, non-thinking beach read, this is perfect. I really liked this book. It was a clean fantasy romance and great for an escape. I felt like the ending was a little rushed, but not so much that it really bothered me. There were also a couple of odd things with pronoun usage. She would start a paragraph talking about one woman and then later in the paragraph "she" would refer to Essie. The same situation with Garreth. However, in spite of that, it was a fun read. The main story line was pretty good. It held my interest and I wanted to see how it played out. But the romance itself was weak. The dialogue was really awkward and stilted. It also read more like a historical novel than a contemporary. I found Essie's character to be inconsistent with the idea that she was a young woman from NYC with a Phd. She acted like a virgin from the 1800's. I also felt like the book was too long. It could have easily been edited down by 100 pages. I loved this book.A bit of romance,Ghosts.Castles,how could you go wrong?The world beneath has been the same for hundreds of years.According to prophecy,that may change soon.J. Stempien was a terrific narrator.I was given this book by the narrator,author or publisher free for an honest review. 3.5 stars. This book moved pretty slow. The meat of the story is good. There are some annoyances that kept this book out of the 4-5 star range for me. Essie's mannerisms, insecurities, and constant blushing felt very 18th century which was hard to reconcile with her 21st century setting. I would expect to find a character like this to be in a regency romance and just turned 18. However, Essie has her doctorate, is supposed to be creeping up on 30, and is from New York. It's annoying when the cha 3.5 stars. This book moved pretty slow. The meat of the story is good. There are some annoyances that kept this book out of the 4-5 star range for me. Essie's mannerisms, insecurities, and constant blushing felt very 18th century which was hard to reconcile with her 21st century setting. I would expect to find a character like this to be in a regency romance and just turned 18. However, Essie has her doctorate, is supposed to be creeping up on 30, and is from New York. It's annoying when the character actions and inner dialogue doesn't fit with the description of who she is and where she's from. The book also had lots of details that slowed it way down and basically only served to lengthen the page count. Meals and walking to and fro with nothing much happening in the process. The book needed a much heavier hand from the editor.